When one of the Choir girls is dropped off at hospital in a severe state after OD’ing on LSD, Charlie is number one suspect, after all if was his car which did the dropping off. Charlie knows he didn’t do it but with no one else taking his side and the only albi he has blackmailing him to do something for her, he finds himself trapped in a web. This web takes the cliques of high school, throughs in cheating, drug dealing and alcohol abuse and makes the foulest tasting cocktail Charlie could ever have imagined. Charlie spends a frantic week trying to clear his name, get his ex back and find out exactly where he wants his life to take him – is it enough or is it a case of too little, too late? Wow, this book has been described as neo-noir and now I’ve read it I can completely understand why. High & Dry is one hell of a book and really expands the YA crime genre beyond any boundaries I have seen before. The story is fantastic but what makes it so is the dryness of its narration. I felt like I had stepped into one of those old fashioned black and white movies with the guys all smoking pipes and one main narrator telling his side of things over the scenes as they happened. It had all the cliques present and the way they all commanded their business was just like the business deals of the olden times, with meetings in dark alleys and promises to keep one another safe. It was brilliant and I really enjoyed it because it was so very unique. The story was fast paced and at the end I honestly couldn’t believe that the whole of it only took a week and a half to actually happen. Charlie is on his toes the entire time and he learns a lot about himself and his so called friends within that time. I loved that there was an aspect of a love story but that it wasn’t the main story. He found himself in the situation because of Ellie and she was a very big part of it but then there was the crime aspect, Charlie’s personal feelings towards his life without Ellie and where that was going and his friendship with Ryder. I thought there was a lot covered in one book and sometimes it was a little confusing to piece out all the different aspects but I still really enjoyed it. Characters in this book are not nice. I got the feeling very early one that no one was to be trusted, including Charlie himself and especially Ellie but as the story went on and things started piecing together I soon learnt that people react differently in different ways to situations and just in real life you shouldn’t judge a character straight away, no matter how nice or evil they seem. I only really liked a few characters from the book, even after I figured out who was to be trusted, and who wasn’t. Jonathan was one of my favourite characters as was Charlie Grandfather and I even loved his parents. Charlie himself grew on me, then he did something to bug me and then he grew on me again. I still have mixed feelings toward him after I’ve finished the book but I think I did like him. High & Dry really was fantastic and I was very engrossed in it. It is Sarah Skilton’s second book and having now read both this and Bruised I can safely say she is an author to keep an eye on – there will be more fantastic reads from her I can assure you! 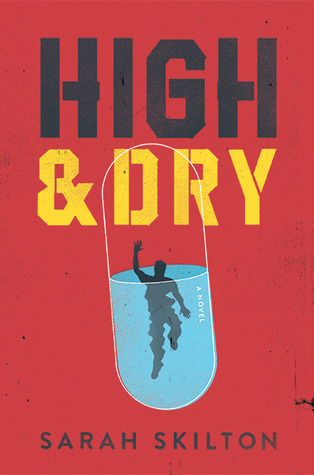 High & Dry was published on 1st April by Amulet books, an Abrams and Chronicle imprint. My copy was sent to me from the publisher in exchange for an honest review.